Hi all. I was perusing through the tankarchives blog when I came across a surprising article (link below). The author discusses a ballistics test conducted by the Soviets on captured German tanks. These were early model Panzer III, Panzer IV, and Stug III. When fired on by the 45mm anti-tank gun, only the Stugs armor resisted the shots. The armor of the Panzer III and IV were defeated. What could explain such a result? The German tanks used FHA plate, and were hit with uncapped AP rounds. They should have been able to shrug off the projectile without issue, and yet they failed to do so. That the plates showed signs of brittle behavior was even more surprising to me. I'm wondering if anyone here has some idea of what could account for this. One wonders how the Soviets interpolate those few shots into 20% and 80% thresholds. What surprises me is the huge drop off in effectiveness when the sloping of the 30mm plates is factored in. When angled at 35 degrees, the gun has a 20% chance of a penetration at 1000 meters. When angled at 45 degrees, the gun has a 20% chance of a penetration at 500 meters. A 35 degree slope offers a multiplier of 1.22. A 45 degree slope offers a multiplier of 1.41. I always though that effective thickness was different from line of sight thickness... Guess I was wrong. In order to assess armor quality it is necessary to understand what armor failing mode one is really looking at. This is, of course, only possible if additional information of both, armor and projectile damaging effects are at hand. Such information is not aviable here. When attacking homogenious, ductile armor, You want an undeformed, sharp tipped projectile. When attacking high hardness and face hardened armors, the best option is again an undeformed projectile with a moderate point. However such a projectile would fragment so You need to improve it´s heat treatment and add an armor piercing cap so that the body stays undeformed and You exploit the shear weakness of these more rigid types of armor. If You are not willing to take a capped AP, then the 2nd best option is to use very blunt APBC projectiles (sharp tipped ones shatter more easily than blunt tipped ones). The StuG was attacked at rather high velocity from the 45mm mod. 1942 gun (V0=870m/s). The soviets themselves credited a penetration in order of 54mm RHA at 500m and 90° to this gun. However, the 30mm side plate was also attacked by the 45mm mod.42 gun and was penetrated at only 850m. This may not be the highest range where perforation occurs. Actual credited penetration of the gun was 28mm RHA at 2000m, 32mm RHA at 1500m and 40mm at 1000m. Again, the projectile does not appear to be sufficiently robust / and or the plate of greatly superior strength here, almost halving the effective vulnerability compared to what one would anticipate. Turn to the PzIII with 30mm + 30mm front armor. Due to the lamination, the effective thickness is merely 55mm single layer aequivalent. And this thickness was not defeated by the 45mm mod.37 gun even at 50m range. Official penetration at 100m was 61mm RHA / 59mm RHA for the 53-K firing AP-HE and APBC-HE, respectively, so it was at least in the right ballpark to affect penetration. So how do You define "defeated"? The 30mm side armor was again defeated at ca. 900m, yet official penetration was 35mm at 1000m and 29mm at 1500m when striking at 0° and 30mm at 1000m when striking with 30°. Again, the 30mm plate behaves quite favourably here, either because it was of superior strength or else, because the projectile was readily breaking up against this 30mm plate unlike against soviet domestic (normal hardness) RHA. Finally, move to the PzIV. Soviet sources credit the 45mm with a complete penetration of 57mm @0° and 100m, so the complete resistence of a 50mm plate at 100m (Pz IV) does not substantiate the idea of subpar armor quality. This plate may seem not as good as the StuG´s but this could also be explained by a variance in projectile quality. Whether the plate or the projectile was better here is difficult to assess with the information at hand. The best indicator of plate quality is when the projectile rejects or perforates while beeing intact (no projectile damage). Only in his case we can be sure that projectile quality variance is a non-factor and remaining variances have to be on the plate properties one. The final drawing of the T34 vs 45mm is a typical red herring here. The T34´s MZ-2 special high hardness armor always shatters the 45mm projectile and this is known long since. The ranges given therein are thus entirely due to insufficient 45mm projectile strength. Fortunately, the soviets also tested 50mm Pzgr39 against this very sort of armor, which constitutes pretty much a realistic test of actual armor against actual enemy projectiles. unlike the soviet domestic AP, the Pzgr39 did not break up at normal impact or with 30° obliquity. The velocity at which the 5cm Pzgr39 obtaines back cracking of a 45mm Mz-2/8-S plate (PTP) was 300m/s with 360m/s resulting in complete perforation (PSP) of the plate at 0°. At 30° obliquity, the velocities changed to 350m/s and 500m/s respectively. Thus the side of the T34 was vulnerable out to past 2000m range when striking anywhere normal to the plate and out to 1300m at 30° to complete penetration. Very detailed and interesting reply. There is much too mull over here. True, its hard to make an assessment without pictures of the armor plates after the firing tests. This is not the first time tankarchives has neglected to provide photographs that were contained within the very reports he translates (!). He did this with the Kubinka tests against the Tiger II tank. Not surprisingly, the pictures clash with his own interpretation of the tests. tankarchives has a proven track record of trying to marginalise the quality of German equipment, almost regardless of the situation. His Russian nationalism interferes with his ability to portray the facts dispassionately. Turn to the PzIII with 30mm + 30mm front armor. Due to the lamination, the effective thickness is merely 55mm single layer aequivalent. And this thickness was not defeated by the 45mm mod.37 gun even at 50m range. Do you think this could be a result of shatter gap? This is a notorious problem with uncapped AP Shells. Would the projectile have penetrated if it had impacted at a lower velocity? Official penetration at 100m was 61mm RHA / 59mm RHA for the 53-K firing AP-HE and APBC-HE, respectively, so it was at least in the right ballpark to affect penetration. So how do You define "defeated"? The applique armor fell away after just two hits, exposing the base armor underneath. Subsequent hits would have resulted in perforation. But more importantly, the turret face was penetrated from 900 meters distance. One shot against the turret hatch opened a crack in the armor. Additional shots opened up even more cracks in the armor. What could explain this effect? Is it simply the result of shear failure from the uncapped AP shells? Soviet sources credit the 45mm with a complete penetration of 57mm @0° and 100m, so the complete resistence of a 50mm plate at 100m (Pz IV) does not substantiate the idea of subpar armor quality. Its curious that the gun penetrated at 50 meters, but failed to do so from 100 meters. This might be the shatter gap at work again. What do you think about the cracks on the backface of the plate? This plate may seem not as good as the StuG´s but this could also be explained by a variance in projectile quality. Whether the plate or the projectile was better here is difficult to assess with the information at hand. Agreed. The T-34s armor profile (with very hard, sloped plates) are ideally suited against low caliber, uncapped AP shells. The fact that they reject the shots without damage is completely unremarkable, if you know a little bit about metallurgy and ballistics. That is one possibility. But really, the term "shatter gap" is used too frequently. While complete nose-to-base- shatter is an extreme projectile failure mode, and will cuase rapid, minute fragmentation (a high number of small fragments), the projectile suffers damage in a great many ways other than shatter. A projectile which is too soft can just bend (offet failure), compress (upset failure) or both. A projectile which is not ductile enough for the stress will exhibit pieces broken lengthwise off (peeling) or outright nose, midbody or base breakage patterns (transverse failures involving a small number of large fragments). An ideal penetrator is in a sweet spot between too hard/brittle and too soft (deformable). Due to careless heat treatment, the soviets managed to make their projectiles soft and even brittle. -but this doesn´t matter as much if You design the AP as deformable and with a flat nose with the outspoken intent to attack by overcoming the plate´s shear strength. Which is, I think, what the soviets planned to do, as all their test plate through ww2 was of high hardness type (that´s also why such a high De Marre K was referenced in their penetration tables). Well, except of course, for the HE-cavity, where it would have mattered whether or not the projectile breaks up. Depending on which penetration definition one uses, increasing the velocity may help to affect (US Army BL) penetration in that the attack of the plastic resistence (intact penetrator) is transferred into an attack to the plate´s shear strength (with fragments). But one would need a huge increase of velocity in order to drive a small number of projectile and plate fragments through the target plate. Again, without photographic evidence for plate and projectile damage it is mood to speculate about the causes. True. I think that the turret armor of PzIII and -IVwas a weakspot anyways-, this, however, doesn´t detriment from the quality of the armor plate testet. The BR-350 was a blunt nosed, ballistic capped projectile. It readily attacks the shear strength of a plate. The alternative penetration mechanism, that is penetration by plastic deformation, is not possible with a flat nosed projectile body. If the projectile breaks up during penetration attemmpt, the resulting schock also makes for a flat nosed attack on the shear strength of a plate. This was also employed in german armor acceptance test in the following form: In order to assess that the plate exhibited good shear strength /resistence to shock impact, the plate was to be attacked at short range by special, uncapped AP shells (f.e. 5cm Pzgr.39 o.K., o.K.= ohne Kappe / without cap). The attack was intended to be borderline success/failure and believed to represent a more severe test of the shear strength than capped AP attack (the latter usually defeats a plate by plastic deformation when ductile or by lower energy plugging, if brittle). The plugs started by flat nosed / uncapped (deformable) AP is considerably larger than was the case when the attacking projectile was pointed and undeformed. A 2cal/plate wide plug was just acceptable in german armor specifications. The capped Pzgr.39 would barely drive out a plug larger than 1.3 to 1.5cal and when penetrating in ductile mode only left a cal size hole. The failure mode of german (tank) armor often straddled ductile and brittle (plugging) behavior at cal/plate ratio because the armor was tweaked intentionally towards the first ductile/brittle transion range in order to extract a higher ballistic resistence to all sorts of attack (rather than one specific), so use of the deformable, uncapped Pzgr39 o.K. represented indeed a more severe test of the shear strength. The soviets had a similar criterion against their own deformable APBC, but the allowable size of the disc was 3.0cal/plate and high hardness, MZ-2 armor couldn´t satisfy even this very mild requirement when attacked by 76.2mm APBC, so they eventually deleted this requirement in order to pass the armor instead of improving the armor to better deal with shear attack. The presence of cracks is not really significant until it is prooven that cracks allow easier penetration. If a cracked plate withstood further impacts without allowing projectile passage, that´s all You can ask for. 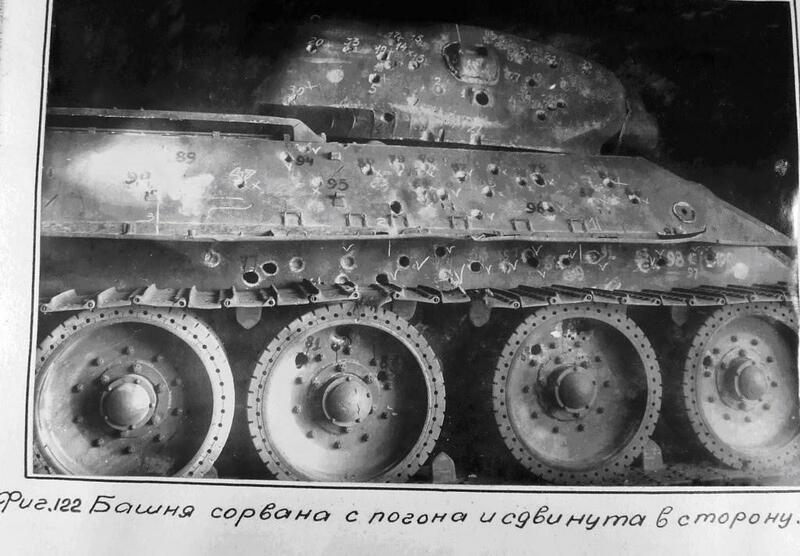 Remember, under these conditions, soviet test plates were completely perforated (not just "cracked") by the 45mm projectile. I don´t think it´s very curious. It might be, that the impact at 50m was just an individually stronger projectile, which happened to suffer less complete breakage under the specific conditions of impact. Remember, the plate doesnt "know" what kind of projectile is attacking it. If You fire two undeformable projectiles, similarely shaped and sized to an identic plate, the plate will act exactly similar to them, regardless of who made these undeformable shells and whattheir designation was. How could the plate know? The physical reaction is exactly the same and doesn´t change because a projectile was made by either A- or B-nation. In practice, there is a large variance in projectile quality and this is a prime factor in many of the penetration differences You see in reports. Peter Samsonov´s ill fated speculations about penetration definitions are really only 2nd and 3rd order effects compared to the effect differential projectile quality bears. Yet, he continues to claim that the variance is a pure expression of definition differences (even when we disprooved his theory that the table contains "test" results rather than "calculations based upon De Marre K=2400", as is written in the subtitle, which he conveniently forgot to mention), but then again, his armor and projectile credentials are virtually zero. Exactly. It has nothing to do with any inherent armor superiority. The T34 armor vulnerability graph vs 5cm Pzgr39 under conditions where the Pzgr39 stays intact is huge. Back crack´s of 45mm plate vs 5cm Pzgr39 were recorded down to 300m/s at 90° and 350m/s at 60° (past max effective range for the short barreled 5cm L/42 KWK38). Of course, the well sloped design of the sponsons and frontal plates of this AFV also meant that only the turret and lower hull were viable long range targets and previous to the introduction of the Pzgr39, the tank was very well protected vs uncapped 5cm AP-HE. The shots against the front of the Panzer IV seem to fit the profile of a radial fracture. There were cracks on the backface of the armor. A similar (but even more exaggerated) effect was observed with the shots against the side of Panzer III. These are brittle failure mechanisms. We've discussed how the type of projectile that strike the armor influences how the plate behaves. But is this the only factor at work in this instance? How would you respond to tankarchives assertion that any sign of cracking is indicative of the plates being 'too brittle'? Were the issues with quality control more prevalent with some calibers than others? Did it get fixed later in the war? Even the 5 cm pak 40 was unnable to actually pierce the T-34s armor (at least, not without APCR). But it could cause damage through spalling or scabbing. Is it true that an armors propensity to spall is influenced by the balance of tensile strength vs plate hardness? Can an armor plate with very high tensile strength experience a spalling event? Ok, I see where the problems come from. First of all, the drawing You choose is entirely misleading but representative of what was understood in the 1940´s and 50´s (in the US) of the armor penetration mechanics. I have changed the drawing to represent the failure modes, and their respective association with failure modes. The drawing posted above has initial and final perforation damages, as well as brittle and ductile failure modes all mixed together. What You call radial failure are actually depicted as star cracks. Star cracks are EXCLUSIVELY associated with initial perforation stages of purely ductile forms of failure and lead either to ductile hole formation (against ductile but very thick plates) or to petalling (against relative to the calibre thin ductile plating). What we today call radial failure is a different event. It´s cracks starting from the point of impact reaching out all the way to the plate´s edges, fracturing the plate in a finite number of fragments. This is associated with no or very little plastic deformation (unlike the star cracks shown) and regardedas a brittle form of plate failure. Notice the difference to star cracks, which are ductile and exhibit plastic deformation. I repeat, the development of cracks in the backface does not need to mean that a brittle event took place. ALL ductile plates initially experience the formation of star cracks at the back before either a ductile hole is expanded by the projectile or the dislodged plate edges fold back creating ductile petals. I have never seen a fully grain fracture when investigating star cracks, ductile hole expansions or petals. Circumferential cracks may indicate brittleness. But even here the plate may also have acted ductile (f.e. when impacted by a flat nosed penetrator, which cause ductile plugging). However, You can tell by microsscopic analysis whether or not the plate´s back was subject to brittle or ductile failure mode. The latter will show an amorphous, fibrous microstructure with little grain presence while brittle failures show grain or predominantly grain mircostructure with areas of shear with what one would perceive as a fairly clean and even fracture. Only outright cracks radiating all the way to the plate´s respective edges with no plastic deformation suggest reliably brittleness, independent of the schape of the penetrator. TankArchives axiometric assumptions regardings brittleness are not based on this worlds physics. It´s not QC primarely. It´s design of the heat treatment of the shell and armor piercing cap. Pzgr 39 projectiles (and the 1950´s soviet copies of them) were exactly in the sweet spot required for penetration without change of shape (RC59-62). This improvement took place during 1941 and 1942, I own copies of the relevant research papers. British APC (RC 65-70)were too hard, which meant a lower critical velocity against most plates but a higher critical velocity against some (particularely thicker plate under moderate oblique impact, where a slightly softer APC would stay intact) due to premature break up of the shell. This also ruled out effective HE bursting under many, particularely oblique impact conditions, and the british consequently had to delete the HE filler from their APC. US APC were too soft (RC 50-55), particularely under the nose (due to the navy sheath hardening temper employed), which allowed bending of the projectile, particularely at obliquity impact, and compression damage (upset failure associated with breakage) when striking at elevated velocity perpendicularely. Soviet AP were soft (RC45 to 50) and even too brittle, which ensured that they would not penetrate in a condition fit to burst unless the target plate was considerably thinner than the projectile diameter. They would fracture easily and could only defeat a plate in intermediate or brittle failure modes. Is it true that an armors propensity to spall is influenced by the balance of tensile strength vs plate hardness? Can an armor plate with very high tensile strength experience a spalling event? Tensile strength is very closely correlated with plate hardness, so no this cannot be said. What is important is the elastic modulus, which is almost the same for steel armor, so resistence to spall has to come from either an increase in section thickness or a reduction of hardness/ tensile strength, which may cause an increase in toughness / plasticity. There are different measures for the latter, reduction of area, % elongation, impact strength, Charpy notch strength and more. The basic idea during ww2 was that the higher the tensile strength, the lower the toughness of the steel. For high tensile strength´s steels, You need low final tempering temperatures, while softer, tougher armor would require a high final tempering temperature. High final tempering temperature is required to make, f.e. ductile mine protection bottom or softer grades of RHA. However, depending on the alloy composition of the steel, there is a caveate here in that there is an intermediate tempering temperature zone, which will turn the material brittle instead of ductile, and this embrittling tempering temperature zone needs to be avoided or even the soft (low tensile strength) armor will turn out to be brittle. In practice, this temper embrittlement could only be avoided if the plate was first heated to tempering temperature, and then cooled very very quickly through the dangerous zone by applying forced cool water jets on both sides of the plate to pass the critical tempering zone quickly. Which is true in that once one obtains the intended tempered martensite crystal structure, one would cool the matrix down quickly to "fix" this crystal structure. Air cooling would cause a change of the steel matrix to a different, bittle crystal structure. German armor specifications were very adamant on careful controll of the tempering temperature times, and required the generally leaner alloyed steel (typically chrome-molly or chrome-vanadium types with nickel only present in thick plates) to be subjected interrupted step tempering with the plates to be hurled in and out of cooling basins with intervals timed to a second. I think they were the only ones to metallurgically fully understand temper embrittlement even before wartime. The US and brits, however, compensated their initial lack of tempering controll with richer alloyed steels (clasical Ni-Cr-Mo steels, with large ammounts of nickel and molybdenium as toughening agents and to combat temper brittleness) with mixed results (generally improving by 1943/44). The soviet´s preference of high alloyed, Ni-Mn-Si-Cr armor steels heat treated to high hardness in T34, T34/85, IS-1 and IS2 was a good choice owing to their lack of understanding of temper brittleness. With high hardness armor, You can forego any sophisticated tempering regime, as the final tempering temperature remains well below the embrittling temperature zone. This temper embrittlement is exactly what happened with large calibre soviet AP projectile steel. Soft but brittle due to air cool after heat treatment (the problem is worse for thick sections due to A) the impossibility to cool them internally, and B) the longer temperature staying time of thick sections). And this is also the reason why the germans discarded burned out AFV as unrepairable and even required the target AFV to burn for making kill claims. When comparing ductile and brittle types of failure one need to factor in and guard against yet another important bias: Every material, even the most ductile types of armor can show brittle behavior in very cool ambient conditions. That is because the ability of the steel to exhibit plastic deformation is dependent on the ambient temperature, too. Armor steel has a temperature, where the change from ductile to brittle behavior takes place. F.e. most 1920´s US armor was having this temperature -measured by Charpy impact notch tests- at approx. 0°C with 1950´s US armor averaging at -50°C. Armor steel which has a very low brittle temperature is thus preferable. This is important when one tries to compare, f.e. a test made under summer conditions (say TIGER I trials) with another one executed at subzero temperatures (say famous TIGER II trials). Thank you for the detailed response, Critical Mass. I really appreciate your edits to the image. It clears away alot of the confusion I had! So the cracks on the back of the Panzer IV plate is actually a sign that they were responding to the projectiles in a ductile manner? Very interesting. Its like the 45mm shells were on their way to penetration, but didn't actually get a chance to before they ran out of energy. After looking more closely at the Panzer III test, I noticed something peculiar. The cracks were only appearing in areas where stress concentration can occur, like the hatch and turret platform. When the 45mm shells hit in other areas, this effect did not occur. The main reason for the difference in the two vehicles armor performance is that the Panzer III was being shot in these critical locations, and the Panzer IV wasn't. I've known about the phenomenon of stress concentration for a while, but I didn't put 2+2 together until I specifically looked at where the Soviets where shooting. This immediately reminded me of the problems suffered by the Liberty ships in the same war. Whats the difference between brittle plugging and ductile plugging? Is brittle plugging more dangerous to the crew? I was also reading about a failure mode called comminuted zone perforation. Is this just another name for brittle fractures? Isn't it possible to manipulate the balance between hardness and tensile strength by using more alloying elements? The Soviets seemed to do exactly this with their tank armor. Couldn't it also be done by controlling the grain orientation and grain growth of the armor during the tempering process? I know that such technology didn't exist in the 1940s, but we can do that now. The research that I've done agrees with this completely. After the Germans lost the nickel mines in Petsamo (Finland), the manganese mines in Krivoy Rog (Ukraine), and the molybdenum mines in Knaben (Norway), they were unable to make high quality armor plate using the same heat treatment methods they once had. This forced them to switch to the interrupted quench system, which some factorys were not experienced with. As a result, they ended up producing substandard plates that had alot of internal flaws in their grain structure. The issue with quench tempering was noted by the western Allies in their metallurgical tests of the Panther armor. The Soviets didn't clue in on this, though, as their knowledge of such things was sub-par at best. The Soviets did use lots of alloying elements in their armor, but they were able to achieve very hard but ductile armor. Pre-war tests showed that their tanks were able to withstand multiple small caliber shots in a tight grouping without shatter. Kindof a wasteful way to achieve their goal, but it worked. Also, didn't they have a bad habit of using burned out vehicles in their ballistics tests? They tested at least one Panzer IV that had been fire damaged. The test on the Ferdinand may also have used a burned out subject. Another good point. I've looked at the Soviet tests against both models, but my conclusion differs from yours. In my humble opinion, I think the armor on the Tiger I performed significantly worse than the Tiger II. Look at the damage it suffers from the 85mm gun. The lower front plate is crater (but no pierced) at 1000 meters. A second hit from 1500 meters then shatters the lower front plate. Its my belief that this particular vehicle must be using face hardened armor. I also think the Soviets were using special ammunition in this test, which were less vulnerable to shattering. This is one possibility. But then again, it could also have been a brittle type of back failure or, equally possible, a crack forming along the circumference of a disc/plug started but not torn free of the backside of the plate. I maintain that without further photographic evidence this question cannot be solved with the information at hand. In ductile types of plugging the penetrator is still intact and exhibits no or very little change of shape. The plate exhibits notable plastic deformation but a ca. cal/wide (up to 1.5cal) plug is ejected. This failure is caused by local adiabatic shear and represents a lower energy penetration failure mode than brittle discing (i.e. the projectile perforates at lower residual velocity). Brittle plugging or discing exhibits very little plastic deformation. The penetrator typically (but not always!) is degraded and subject to noticable change of shape. In addition to one large disc/ plug (ca. 2 cal/wide, sometimes much larger)sometimes a small number of small fragments are ejected from the back of the plate. This is a higher energy penetration failure mode than ductile plugging (i.e. the projectile perforates at elevated velocity). Kind of, yes. But it´s caused by buttressing a plate against something so rigid, that plastic deformability has nowhere to go and microcrack propagation is encouraged. It´s a majore topic in protective tile design, though. You probably mean the balance between hardness and toughness (or, tensile strength and strain rate). Alloys don´t give hardness or toughness. All alloys do is that they manipulate the response of the steel to heat treatment (and, to a lesser degreee, to mechanical treatment). The heat treatment and the respsonse to heat-treatment of the steel is what actually fixes the crystal structure which will translate itselfe into physical properties such as tensile strength and strain rate. It´s therefore better to associate alloying with concepts such as "hardenability", "through-hardneability", "suspectability to temper brittleness", and so on. Again, I do not buy the idea that lack of alloys such as nickel or molybdenium directly caused inferior armor plate. These alloys were also lacking in projectile steel, yet they managed to produce excellent quality AP right up to the end of war, with their respective quality improving. I have not seen any evidence that subpar armor was tolerated by QC and procured to the end of ww2, yet, I have seen accounts which claim that armor steel, like projectile steel, continued to improve late war (Dr. Wagenknecht from Bochumer Hüttenverein, f.e.). It´s true, however, that not all manufacturers were capable of meeting the necessary tight heat treatment specifications late war, and that lean alloyed E-steels were also considered somehow tighter in error ranges to heattreaments (smaller variance between ductile and brittle), both potentially messing with QC. grain orientation can be controlled by mechanical treatment (rolling & cross rolling), at least in two of the three dimenions of the armor plate and this was exploited during ww2. Grain growth was attempted to be manipulated by electro casting of the heat, with more mixed success. The radial failure of the nose plate indeed is a brittle failure event. But one need to keep in mind that A) the armor was treated to the 1st ductile/brittle transition range on purpose for optimum ballistic performance (which may encourage a higher frequency of brittle events againt flat nosed attack) and B) The hit at 1500m happened to strike close to- or at the spot where two previous impacts left dents. It would not be considered a fair hit for this reason. A 2nd hit at 1500m at the drivers plate by the 85mm just dented the armor (small bulge in back, no cracks). None of the impacts shows sign of face hardened armor. Last edited by critical mass on 22 Nov 2018 19:29, edited 1 time in total. In brittle types of plugging the penetrator is still intact and exhibits no or very little change of shape. The plate exhibits notable plastic deformation but a ca. cal/wide (up to 1.5cal) plug is ejected. This failure is caused by local adiabatic shear and represents a lower energy penetration failure mode than brittle discing (i.e. the projectile perforates at lower residual velocity). I think you meant to write "ductile types of plugging" here. You are, of course, entirely correct. I will edit it accordingly. Thanks for pointing the typo out. Glad You found the memo useful. Yes, theres lots of good answers to go over. Thanks again for the excellent response, critical mass. For those who are wondering, although the Tiger II was abandonned during some hot day in the summer, as far as I can remember - and correct me, if I'm wrong - the tests with the 122mm and 100mm guns were conducted during mid November 1944, when it was -2°C on average. Last edited by seppw on 23 Nov 2018 09:53, edited 2 times in total. Also, I believe the captured Kursk armor was tested much later in the year actually showing snow.